spaces and display requirements. Larger sizes and taller wall heights allow you to maximize display space while maintaining full weather protection. Skylight and Vents: Frosty-clear vinyl with UV inhibitor provides bright, diffused natural lighting without direct sunlight. Heat/wind vents at both gable ends of the top relieve heat build-up and wind pressure. 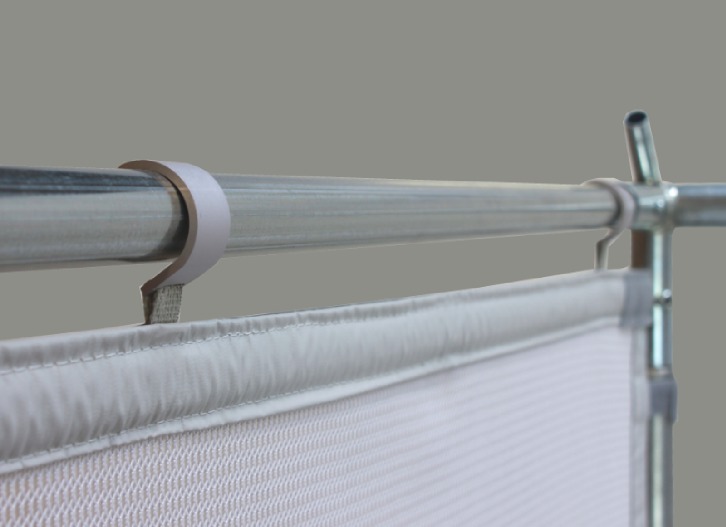 Valance: To ensure full weather protection, the canopy top is designed with a generously cut valance to completely cover the zippers joining the sidewalls to the top. Corners open for access to zippers and close securely for a snug fit. Full Weather Protection: Every TrimLine includes a full set of Standard Sidewalls. 10x10 sizes include 4 walls at 10 ft. width; 10x15 includes 4 walls at 10 ft. width and 2 walls at 5 ft. width; 10x20 sizes include 6 walls at 10 ft. width. Sidewall Zipper Detail: Each canopy includes a full set of standard zippered sidewalls made with heavy-duty marine grade #10 zippers. Walls zip to the top and to each other to create a fully enclosed, waterproof booth. 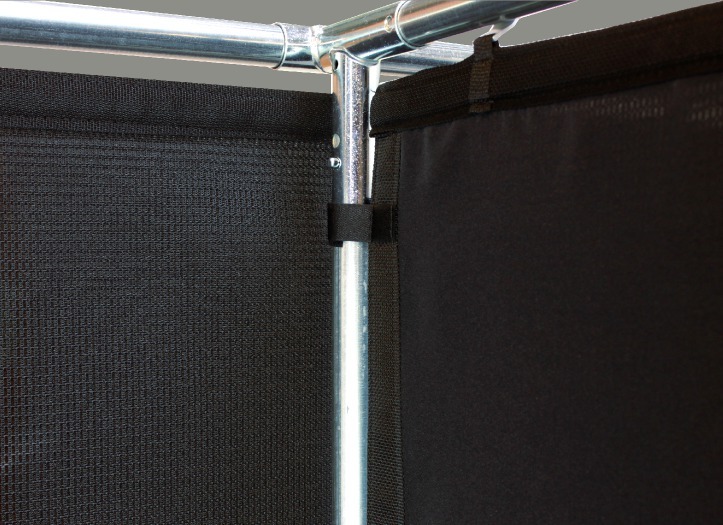 Sidewall WindStraps: Sidewalls feature Velcro WindStraps to anchor walls to legs, allowing one or more walls to be removed while preventing the remaining walls from billowing into the booth. Adjustable Leg Height: Canopy legs are designed to accommodate uneven ground with a full 12" of height adjustment built in. Adjustment settings are at 1 3/4" increments. Sidewall RollUp: Roll-up straps at the top of the wall secure the rolled wall out of the way if you choose to leave it on during the day. When weather threatens, roll-up straps keep walls ready to drop at a moments notice. Frame: Click-together galvanized steel pipe and self-straightening PVC rafters. Hardware: Zinc-plated. Snap-buttons and thumbscrews connections. Top & Sidewalls: 11 oz vinyl. Certified Flame Resistant, 100% waterproof. 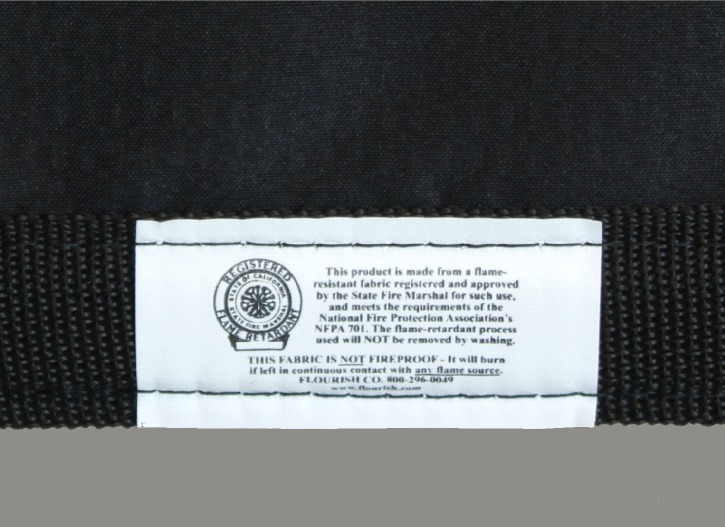 Flame Resistance: The top and sidewalls of the TrimLine canopy are Certified Flame Resistant and every product has a Flame Resistance Certification sewn into the binding, as well as a paper document. Anchoring: TrimLines arrive with a set of Ground Screws and 10” Steel Spikes for anchoring the canopy to the ground. Cross spikes through feet to create a secure anchor. 10X10 - 2 screws & 4 spikes; 10x15 and 10x20 - 4 screws & 8 spikes. Packed Up: All parts of a 10x10 TrimLine with a full StaBar Kit, ready to pack into a vehicle for transport. The longest pole section measures 61” and every order includes heavy-duty ball Bungees for bundling poles. Classic set up of a 10x10 TrimLine with a 30" Awning at the front. Clean, simple and secure. 10x10 TrimLine, top vents open to help release excess heat. 10x10 TrimLine with 30" front Awning, lower StaBars and custom drapery for a bright and airy looking display. Side-by-side TrimLines showing top set up options. On the left, the gable end faces the front. The booth on the right orients the gable ends to the sides. 10x10 TrimLine with 30" Awning. Wall Height LightBar provides light for work on pedestals at the right side of the booth. 10x10 TrimLine with 30" Awning and a set of four GreatWeights for anchoring on pavement. 10x10 TrimLine with DoorWall Frame and StaBars (set at mid-wall height). Wall-Height Light Bar supports ample lighting for evening show hours. 10x10 TrimLine with MeshPanels. A DoorWall gives easy access to storage space behind booth, and MeshPanels provide display space for canvases. 10x10 TrimLine with a Frosty Gable Top for extra bright lighting. MeshPanels provide a bright and airy backdrop and GreatWeights anchor the canopy on pavement. 10x10 TrimLine with Awnings front and side. Shade dappled 10x10 TrimLine with corner set of StaBars (rear wall and one side wall). A 10x20 TrimLine with wrap-around Awnings and an innovative use of full-width MeshPanels creates an inviting booth with an open feel. 10x20 TrimLine with 30" Double Awning at the front and 54" Awning on the side. MeshPanels provides plenty of display space for large scale work. 10x20 TrimLine, 30" side Awning, 30" double Awning at the back to protect extra stock. Narrow curtains at the legs add a pop of color. 10x20 TrimLine; Gable vents open for ventilation; track lights mounted from center pole. 10x20 TrimLine with 30" double Awning at the front. Creative use of display walls maximizes display space. 10x20 TrimLine with 9 ft. wall height and wrap-around 30" Awnings makes for a dramatic display space. 10x15 with a single 10 ft. wide Awning at the front. 10x20 TrimLine with 30" double Awning provides a clean backdrop for colorful glass work displayed on pedestals in front of the booth. Soaring 10x20 TrimLine with 8 ft. wall height and 54" Awnings on the front and side, joined by an Awning Corner Cloth for wrap around coverage. 10x20 TrimLine with Double Banner Frame for highly visible display space at the front of the booth. 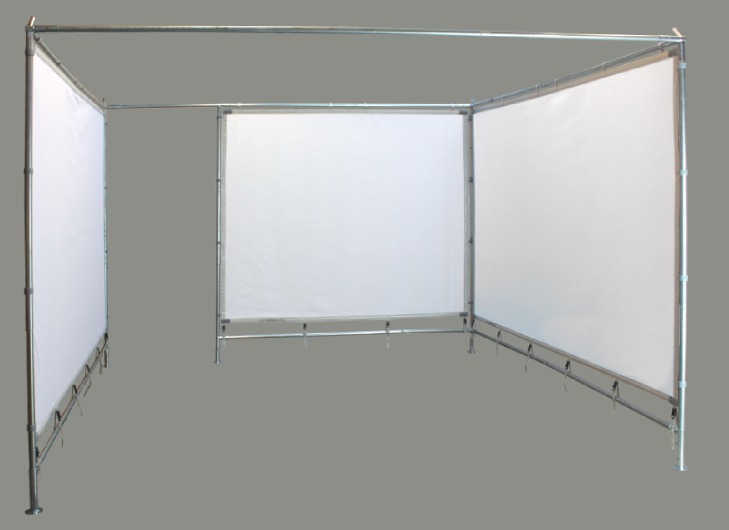 A 9 ft. wall-height TrimLine with 54" Awning at the front and 30" awning on the side. Next door is a standard 7 ft. wall-height TrimLine with a 30" Awning. 10x10 TrimLine converted to 9 ft. wall-height. 30" Awning is installed just below SideWall Height Extenders. 10x10 TrimLine with 9 ft. wall-height. 54" Awning over the right side wall. On the left wall is a 9 ft. MeshPanel. A pair of side-by-side tall tents. Both are 10x10 TrimLines at 8 ft. wall-height with a 54" Awning at the front. 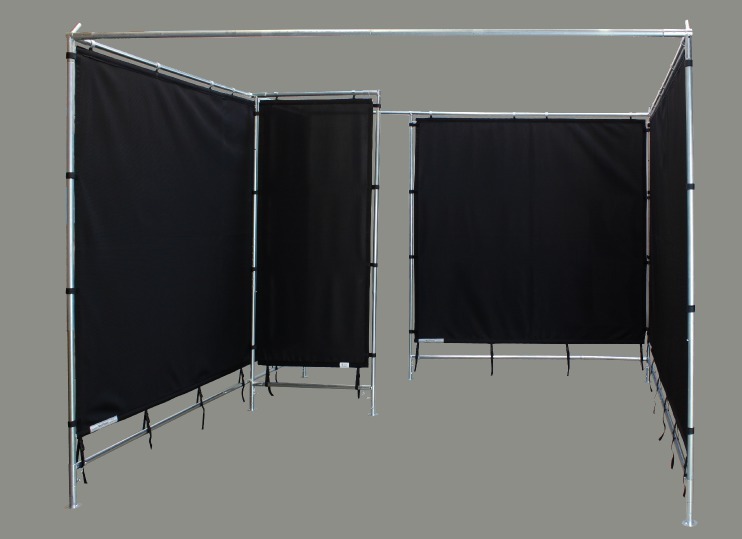 8 ft. wall-height TrimLine with MeshPanels for 8 ft. walls Two 54" Awnings. 8 ft. wall-height TrimLine set up on a corner wtih one 54" Awning and one 30" Awning. A LightBar set on the Riser poles supports Track Lighting. 9 ft. wall-height with legs extended to nearly 10 ft. tall! Using both Lower StaBars and Upper StaBars keeps this tall booth steady. 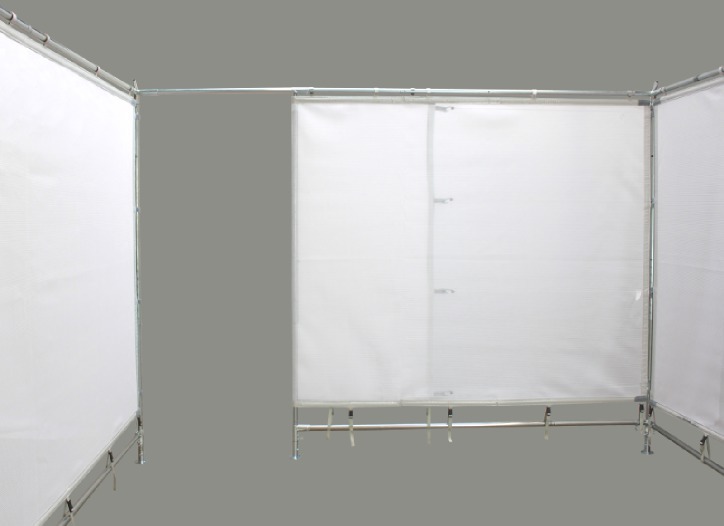 8 ft. wall-height TrimLine with MeshPanels for 7 ft. wall-height, DoorWall at left side. 30" Awning at front, set at an incline by moving the frame down on the legs. 9 ft. wall-height TrimLine with 54" front Awning. At this height, a small sign can be suspended from the Awning frame for extra visibility. Two 8 ft. wall-height TrimLines with 30" Awnings at the front. On the left, the top vent is shown closed; on the right, it has been rolled open. 10x10 TrimLine with 8 ft. wall-height set up for a corner booth space with 30" Awnings at the front and side. 8 ft. TrimLine with 54" Awning at the front and 30" Awning on the side. StaBars for extra stability. Next door is a Standard 7 ft. TrimLine. A taller TrimLine with 54" front and side Awnings. An Awning Corner Cloth creates continuous coverage. All Awnings in Frosty vinyl for extra light. A 30" Awning at the front of the booth welcomes customers while a second 30" Awning at the side protects an outside wall of artwork. 30" Awnings on the front and side protect this corner booth from sun and rain. A LightBar set between the canopies Riser poles supports lighting. 30" Awning at the front of a standard 7 ft. wall height 10x10 TrimLine. Gable vent is open for added air flow. Tony uses an Awning frame at the back of the booth with the back wall pulled over it to protect his storage and packing area. A 54" Awning at the front of a TrimLine with 9 ft. wall-height provides a perfect place to hang a sign. A pair of 54" Awnings joined by a Corner Cloth extend this booth ft. s display space and presence on the street. TrackLights mounted to outer edge. 54" Awnings for a 10x15 TrimLine. Awnings front and back extend the selling space of this corner booth and protect the artist from the sun at a summertime show. On the left is a 9 ft. wall-height TrimLine with 54" Awning at front and 30" Awning on the side. On Right is a 7 ft. TrimLine with 30" Awning and rear door. A Banner Frame with a full size banner mounted to a front Awning on a 10x20 TrimLine. A set of GreatWeights attached to Lower StaBars anchors this tall TrimLine. A Banner Frame is mounted at the front edge of an Awning frame for excellent visibility on this 10x10 TrimLine. Tie-Down Screws anchor the corners of this booth in a park setting. We recommend placing ground screws as close to the walls as possible to minimize the risk of tripping. A 10x20 TrimLine set up as an indoor booth. A double length Above Wall LightBar and Flame Resistant Drapery complete the look. 10x20 Trimline viewed from behind to show the use of an Upper StaBar for supporting wire grid walls. Note that the Upper StaBar is matched to a DoorWall Frame, allowing easy access to space behind booth. Adjustable Leg Height: Canopy legs are designed to accommodate uneven ground with a full 12” of height adjustment built in. Adjustment settings are at 1 3/4” increments. The lightest, most compact professional display walls available! 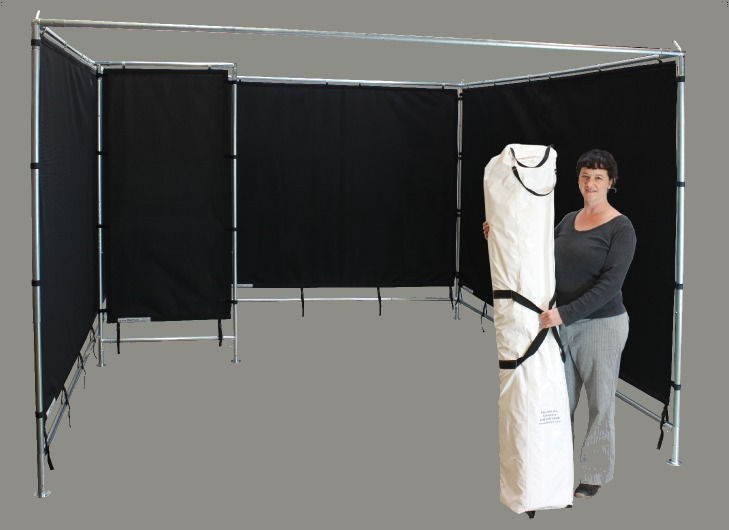 A set of 3 full-width panels stows in a single carry bag and weighs 23#(MeshPanel) or 34#(SoftWall). Carry Bag included with purchase of full set. A DoorWall provides easy access to the space behind the booth. The DoorWall Frame paired with a 7 foot wide MeshPanel or SoftWall creates a beautifully finished look. 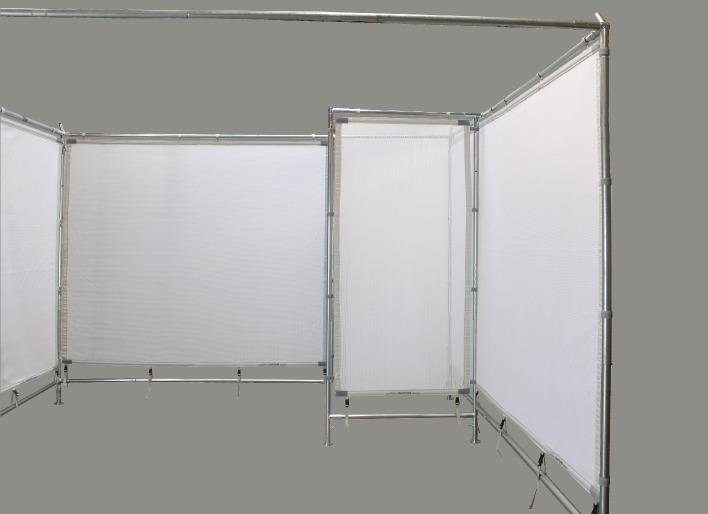 MeshPanels and SoftWalls attach directly to the frame of your canopy or indoor booth. 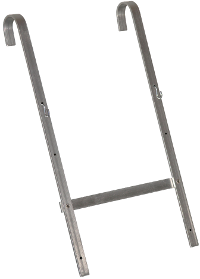 At the top edge, aluminum hooks slip over the top bar of the frame. The versatile Convertible MeshPanel can either be set up at the full 10 ft. width, or wrapped around a DoorWall Frame to create a doorway to the back of the booth. In order to stretch panels smooth, a StaBar is required at the bottom edge where buckle straps allow for easy tensioning. Velcro straps attach panel to vertical legs. Our most popular configuration combines the easy access of a DoorWall with the visual interest of a FrenchWall. The FrenchWall also serves to screen the doorway from view. Extra buckle straps at the top edge allow MeshPanles to be attached to the scissor-work of a pop-up style tent frame. A lower StaBar is required to complete set-up. A FrenchWall inside a 10x10 booth screens a small storage area in the back corner, as well as creating visual interest. 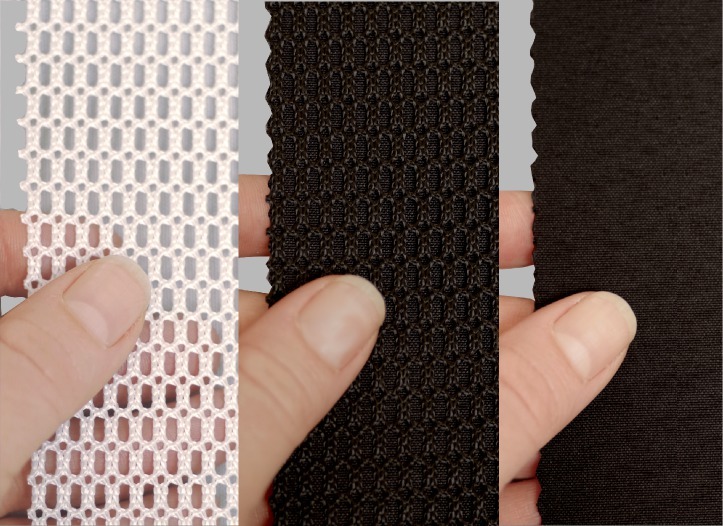 Fully reversible black SoftWalls have a mesh surface on one side and a smooth fabric surface on the other side. Center) black SoftWalls are composed of two layers. Black mesh faces in. All materials used in the construction of MeshPanels and SoftWalls are Certified Flame Resistant. Panels have sewn-in verification as well as a paper certificate. Hanging artwork is easy! Use S-hooks or Drapery Pins on white MeshPanels. For black SoftWalls, use Drapery Pins on fabric and S-hooks on the mesh. A simple and effective display using a full set of MeshPanels plus table covers with bright color accents to highlight the artwork. A full set of MeshPanels with a 3 ft. FrenchWall. Awnings protect work hung on the outsides of the panels and a LightBar supports plenty of lights for evening hours. Two full-width MeshPanels provide a backdrop on the sides of this jewelry display. A pop of color comes from the drapery at the back of the booth. Full-width MeshPanels easily support the weight of these stained glass pieces. A beautiful indoor display with a full set of MeshPanels. Bruce uses his TrimLine frame without the rafters to create his indoor booth frame, adding an Above Wall Light Bar with TrackLights. A full set of MeshPanels with large scale work hung on both inside and outside of panels in this TrimLine. Wrap-around Awnings serve to extend the display space. A beautiful use of MeshPanels and FrenchWalls in a 10x20 corner booth. FrenchWalls help to create a traffic flow through the display. A 4 ft. FrenchWall screens a DoorWall opening onto storage space behind this booth. 7 ft. wide panel on rear wall. Full-width black SoftWalls create a dramatic display in a 10x10 TrimLine. A 10x20 indoor booth with full-width MeshPanels on a MeshPanel Booth Frame. Lights mounted to center upper pole of frame. An indoor display built for a long, narrow space. Two 10 ft. wide panels connect at the center and are supported by 4 ft. wide panels at either end. Creative use of two French Walls creates a dynamic display space. A DoorWall behind the second French Wall gives access to storage space. 10x10 TrimLine at 8 ft. Wall Height with a 30" front Awning frames this classic MeshPanel display. Full set of panels plus one 4 ft. FrenchWall. MeshPanel Display. Full-width panels on side walls, 7 ft. wide panel on a DoorWall Frame at the back, and a 4 ft. FrenchWall. MeshPanels set with DoorWall Frame and Convertible Width MeshPanel on the back wall. A Convertible Width MeshPanel with a DoorWall Frame allows easy access to the back of the booth when space allows. 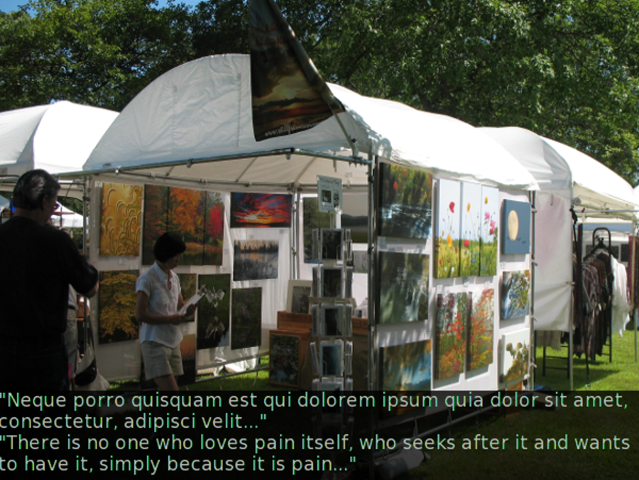 Panel can also be set-up as a full-width wall. A DoorWall Frame with a 7 ft. wide MeshPanel allows the artist to use the space behind the booth for her chair and desk, as well as extra stock. Two full width MeshPanels and one Adjustable Width Panel paired with a DoorWall Frame gives access to the space behind the booth. MeshPanel set with 4 ft. FrenchWall. 10x20 MeshPanel Booth Frame with two FrenchWalls. A Canopy-Ready MeshPanel Booth Frame with a DoorWall and MeshPanels. MeshPanel Display. A FrenchWall at the front creates an dynamic booth layout. Full-width MeshPanels on side walls, 7 ft. wide MeshPanel on DoorWall Frame at the back, paired with 3 ft. FrenchWall. Full width panels on the side walls combine with two 4 ft. FrenchWalls to create an easy to walk through display space inside a Pop Up tent. A full set of MeshPanels with StaBars adds strength and stability to this Pop Up tent while creating a bright and professional looking display space. Full width MeshPanels inside a 10x20 Pop Up tent. MeshPanels in a Light Dome Canopy. A 4 ft. FrenchWall screens a DoorWall at the back of the booth. A full set of MeshPanels for a Pop Up tent provides plenty of display space both inside and outside the tent. 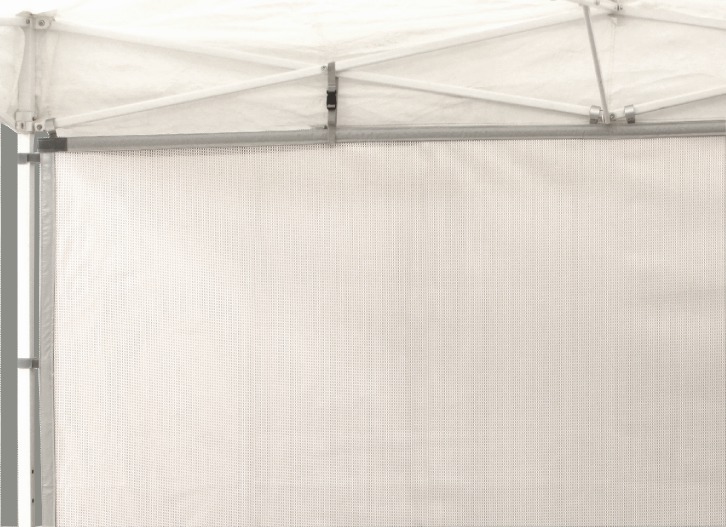 MeshPanels in a Pop Up tent. The use of Upper StaBars allows for the addition of a DoorWall Frame and FrenchWall. A full width MeshPanel provides a simple backdrop for this clean and simple display inside a Light Dome Canopy. A full set of MeshPanels plus a 4 ft. wide FrenchWall inside a Pop Up tent creates a clean background for these large scale paintings. 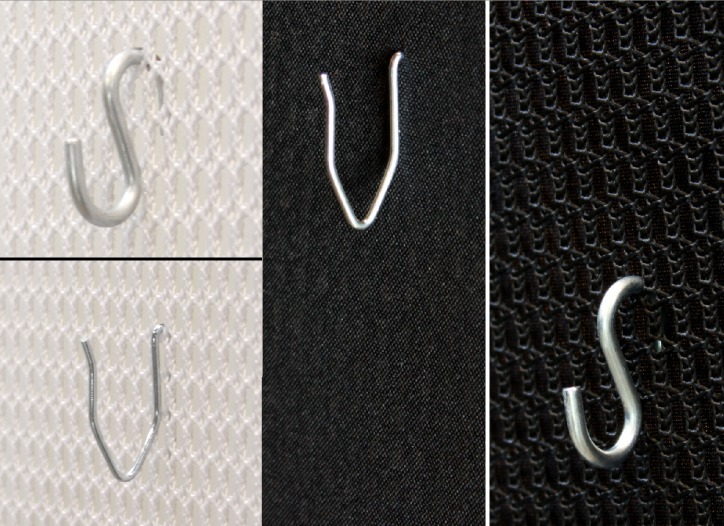 MeshPanels can supprt individual pieces up to 18 pounds on a pair of S-Hooks slipped directly into the mesh. For heavier pieces, we offer aluminum StrapHangers. Matted work can be hung using HookClips. hooks per piece for stabilty. and ProGallery Covers. For Graphic Display Panel Covers, use the large size. 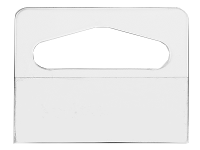 HangTabs feature a strip of adhesive and an S-Hook receptive hole in a thin piece of clear plastic for hanging unmounted works. Use in conjuction with S-Hooks. 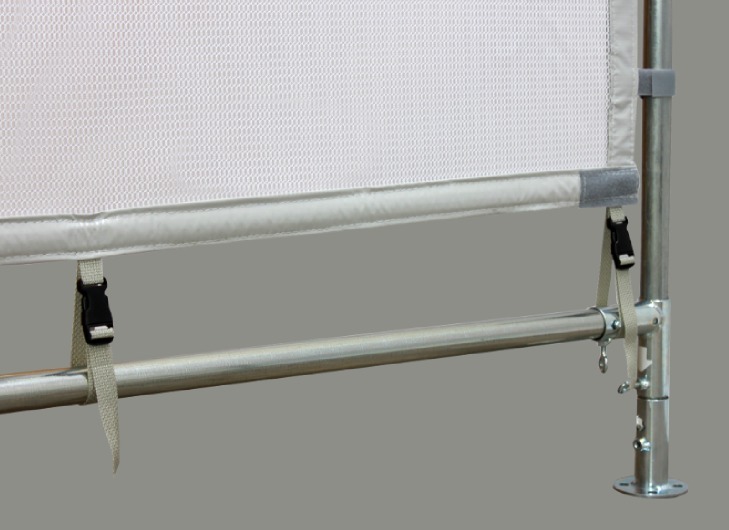 StrapHangers allow you to hang heavier work by using the top bar of the canopy or booth frame to support the weight.Available in a range of lengths and widths to accommodate work of all sizes. 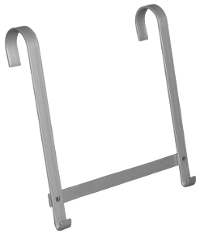 Adjustable StrapHangers offer flexibility in length and are available in several widths. on 16" length, 6 height settings on 24" length.